Monaghan Tidy Towns celebrates biodiversity in signature event. “Monaghan allotments have been developed in a very biodiversity friendly way with plenty of space for wildlife, orchards, new native hedgerows and pollinator friendly planting. Rainwater harvesting and other sustainable projects are also on show. We encourage everyone to come along for an hour or two. Biodiversity is shortened from ‘biological diversity’. Biodiversity is the variety of all life forms on Earth, from the tiniest bugs to the biggest whales in the sea. Ecosystems or habitats (habitat diversity). The biological diversity we see today is the result of millions of years of evolution. It is always changing and evolving as some species adapt to new surroundings, some become extinct, and others evolve into new species. We are also an integral part of biodiversity and we can influence it in a positive or negative way. Most people think of hanging baskets and litter picking when they hear the words “Tidy Towns” but the truth is more complicated than that. The work of Tidy Towns committees in towns and villages across the country has moved on to encompass a much wider remit where the environment and sustainability take centre stage. One area in which Monaghan has done well over recent years is “Wildlife, Habitats and Natural Amenities”. We have also entered the special Notice Nature Awards and have been highly commended and joint runners up nationally for the last two years. Not wanting to rest on our laurels we are hoping to boost this area further this year by promoting even greater awareness among the people of all ages of the great biodiversity that exists within our town environs. Our aims are to create awareness and appreciation of the biodiversity of Monaghan Town and its environs and to develop an education infrastructure and perspective on an ongoing basis and to promote Monaghan as a “Biodiversity Town” both within the town, its people, schools and community as well as for visitors. I suppose the starting point for our work in biodiversity was a habitat survey carried out for us by Billy Flynn of Flynn Furney Ecologists. Reading the completed study brought home to us all the richness of habitats and flora and fauna in the town. The existence of waterways including lakes, rivers and canals coupled with green areas and woods such as Tom Young’s Wood lead to an abundance of habitats for sorts of interesting creatures. We are seeking to develop our town as a “Biodiversity Town” where the whole community is educated, aware and appreciative of the biodiversity that exists in the town and its environs. We aim to be holistic in our approach by including as many facets of biodiversity as we can – isn’t that what biodiversity is about after all? We began by making a Biodiversity Plan based on the original habitat survey. That plan has been updated and revised a few times over the years as active plans should be and we are busy updating it again for 2015 / 2016. We supplemented this with surveys on birds, trees, a tree planting plan and a plan for Tom Young’s Wood on the Clones Road. Next we moved to develop our biodiversity infrastructure with interpretive trails and signage through the town starting at Peter’s Lake and complete with QR codes linking to our web site. Last year we added biodiversity signs at Tom Young’s Wood and along the Greenway accompanied by activity sheets for schools. An outdoor education area or classroom has been developed at Tom Young’s Wood, an excellent site for biodiversity on the outskirts of town and within walking distance of four schools. These are now being supplemented by bird tables, bird houses and more bat boxes in numerous locations. We have organized biodiversity workshops for Junior Tidy Towns children with the Biodiversity officer and Eco Camps during the summer include biodiversity themes. Monitoring, surveying and recording play a large part in what we do. A professional survey on Monaghan’s birds was conducted over the four seasons of the year was completed in 2012 and is now being up dated. Visits from an expert from Birdwatch Ireland were offered to schools. A town tree survey by our horticulturalist Denis Flannery was also completed in 2012 and followed up with a tree planting strategy for 2013 and 2014 with more trees planted at Peter’s Lake car park last year. Denis just loves trees because they are a great long term investment in the biodiversity and natural landscape of the town. We continue to work on the control of invasive species such as Japanese Knotweed and the elimination of noxious weeds such as ragwort. We’ve had seminars on butterflies through the Tidy Towns Network a biodiversity kit is available on loan for schools and other groups to use. Local schools participated in a “Nature Detective” workshop looking at indicator species in rivers and streams. A school competition to “Design a Bird Feeder” from recycled materials led to an inspiring display in an empty shop window. With the help of community volunteers and the Irish Wildlife Trust we planted 15,000 bulbs (crocus, daffodil, tulip) in 2013 so the town was very bright and colourful last spring. We added a further 5000 last winter. Our most recent project has been the development of the area around the old canal lock house on the Greenway. This area has been planted with fruit trees and bushes an our ultimate aim to create a Victorian style garden where fruit and flowers combine to attract pollinators and reduce the need for artificial control of pests. This year we intend to add biodiversity signs for the allotments area and the community garden, initiate some beekeeping and develop education on bees, organize more walks and talks, especially along the Greenway and add some work on squirrels and hedgerows. We hope our biodiversity project will continue to grow and heighten awareness of the meaning of biodiversity, awareness of habitats and species in the town and a respect and appreciation of both across the whole town population. We also seek to promote our town as a place that appreciates, promotes and protects biodiversity. We have many people to thank for our success so far. We have continued to work with our environmental consultant and we greatly appreciate the support of the council and its staff including Carol Lambe in Community and Enterprise, Council Environment Officer Nial O’Connor, the Action for Biodiversity Officer, Carmel Brennan, Heritage Officer Shirley Clerkin, the staff of the former Town Council and the current staff of the Municipal District of Monaghan in developing our plans. We hope that the people of Monaghan Town and visitors to the town continue to appreciate the rich diversity of nature that exists here and that we can all work to protect it now and well into the future. Billy Flynn, Flynn Furney Ecologists. A gust of wind blows some dust into the narrow gap where the pavement slab doesn’t quite meet the wall. It might not sound like much but it’s a start. A new ecosystem might just have begun. More dust and dead leaves blow in and gather in the gap. It rains, as it often does, and there’s now moist earth. It still doesn’t look like much to you or me but for the woodlouse and millipede this is food and shelter. More wind blows and seeds land in the gap. The dead leaves carry fungi and bacteria which break them down and nutrients are freed. The sun shines and a green plant grows. In only a matter of days, nature has moved into town. The humble beginnings of the urban environment might not be terribly thrilling to watch and mightn’t ever make a great documentary but it’s going on all around us. In fact, anyone who lives in a town walks past it every day. Ever since we began living in settlements, nature has always come with us or at least followed close behind. Our dwellings have become theirs too, very often without us even noticing. The clue is often in the name: house martins for example. They didn’t always nest in the eaves of our houses as they do now. They were cave and cliff-dwellers, as were their larger, noisier cousins the swifts. The same is true for barn owls which made their nests in old and dead trees before anyone ever made a barn. For these birds, we’ve created facsimiles of their preferred habitat by creating our own. In some instances we add other bonuses, such as food and warmth. Why else does the house mouse seek out our company? Or the house spider for that matter? We make things very attractive for the house flies though we might not welcome them. Not everyone likes to think about the countless creepy-crawlies that we rub shoulders with on a daily basis but they have a role too, not least as food for some of the more agreeable species like the swallow (also known as the barn swallow, by the way) without which no summer would be complete. Thankfully, most species of urban wildlife aren’t trying to crawl around our homes but manage to make a comfortable existence for themselves in our gardens. The lawns, shrubs and trees provide accommodation for endearing (if elusive) mammals like hedgehogs and a rather ordinary garden might have a half dozen songbirds competing for space and mates on any spring day. We’ve created hard, barren surfaces that suit our needs but we’ve also left gaps which nature readily fills with many kinds of delightful and fascinating living things. We don’t own them but just by being here they give us great pleasure nonetheless. It’s the least we can do to be gracious hosts. Monaghan Town is amply endowed with spaces where wildlife can feel right at home. A real highlight is the Ulster Canal - a 150 year-old wildlife corridor which allows mammals (including bats) birds and bugs to travel freely trough much of the town. Now, thanks to the Ulster Canal Greenway, people can do so too. There are few better places where we can walk and appreciate a variety of habitats over a few very pleasant kilometres. Otters and kingfishers are among the distinguished residents of this beautiful old waterway. Right in the middle of Monaghan Town is Peter’s Lake. This natural water body has a rich fringe of reeds and other plants that are home to several species of birds and countless bugs. Take a little while to read up on the wildlife of Peter’s Lake on the information board here. Take a long walk or a cycle out to Ballyalbany and the Ulster Blackwater. This is a really important river for several fish species including salmon, trout and eel. 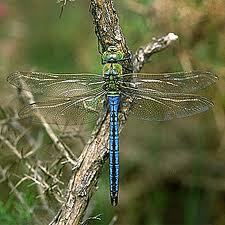 It’s also a great place to spot dragonflies on summer days. You may have only noticed it in passing, but the Shambles River flows right through our town. Covered along part of its course, it once was used as a channel for waste from the butchering of animals but now flows cleanly and freely through the town. It provides spawning habitat for fish and habitat for the bugs they will grow up to eat. There are few better places to admire mature trees in a semi-natural setting than Tom Young’s Wood on the Clones Road. The mature ash canopy here allows lots of light for the very many wildflowers that make springtime a delight in this woodland. Trees are a great reason to enjoy long walks in the campus of St Davnet’s Hospital. Mature trees of over a dozen species can be seen here. This makes the grounds a haven for birdlife and the wide open spaces that sweep all the way to the canal make this an ideal place for bird watching.